Yes, the 2013 Mac Pro reviews are starting to pile up and, as exemplified by the quote from former Apple hater Molly Wood in the headline, there is much to love about the gloriously small, impossibly shiny and value-laden Cupertino trash can. Or, Darth Vader’s helmut if you prefer. However, you slice it, though, people are excited about the Made in USA 2013 Mac Pro. And, the praise isn’t just coming from the usual suspects. A surprisingly broad spectrum of hardware pros and users, many of whom aren’t friends of Apple or the fairer platform, are giving high marks in their Mac Pro reviews. David Pierce, The Verge — The Mac Pro’s most impressive performance may be currently reserved for Final Cut Pro X, but it won’t be long before other apps catch up. If Apple’s guessed right and stays committed to its ideas, there’s almost certainly going to be a renewed interest in both the Thunderbolt ecosystem and in building and optimizing apps that take advantage of the device’s two GPUs. Apple built the Pro not just to give developers the tools they want, but to encourage them to build other ones too — if they do, the Pro could quickly turn from subtle speed bump to an actual rethinking of what desktop PCs do and what we can do with them. Not to mention what it all looks like sitting on our desks. Dan Grabham and Patrick Goss, TechRadar — If you’re thinking this Mac is too expensive, you’re thinking about it in the wrong way. It’s a completely different proposition than an iMac or Mac mini. This is a high end workstation for serious power computing and applications such as media processing and editng. It’s one of the reasons why the future of the Mac is a safe one. It’s superbly designed and has all the panache you expect from Apple. What a machine. Dan Frakes, Macworld: — For many years, “pro” meant a big, expandable tower case, lots of internal storage, replaceable graphics cards, and so on. For Apple, it now means “maximum performance when using pro apps.” In that respect, the new Mac Pro reflects multiple trends in computing. It, of course, continues Apple’s ongoing shift across its product lines towards flash storage and external expandability at the expense of capacious hard drives and internal upgrades. But it also illustrates the ways in which Apple and other vendors are responding, at the high end, to the fact that processor speeds simply aren’t increasing at the same rate that they used to: Namely, they are focusing on multi-core and GPU-based processing technology, in both hardware and software. Ryan Bushey, BusinessInsider — The tiny size, compact design, and modular expansion setup make for a relatively portable workstation. While the office bound user might not make much use of it, photo and video editors will often haul along a workstation for use in the field, allowing them to edit together rough cuts while on location. For media professionals, that portability will let them take their work almost anywhere. Dan Ackerman, CNET: — Is the Mac Pro a killer performance machine? For $8,000 it had better be. In our benchmark testing, the system turned in excellent scores, ripping through video encoding and other tasks. … The Mac Pro, as configured, was in most cases well faster than even the most high-end Windows desktop we’ve tested this year. 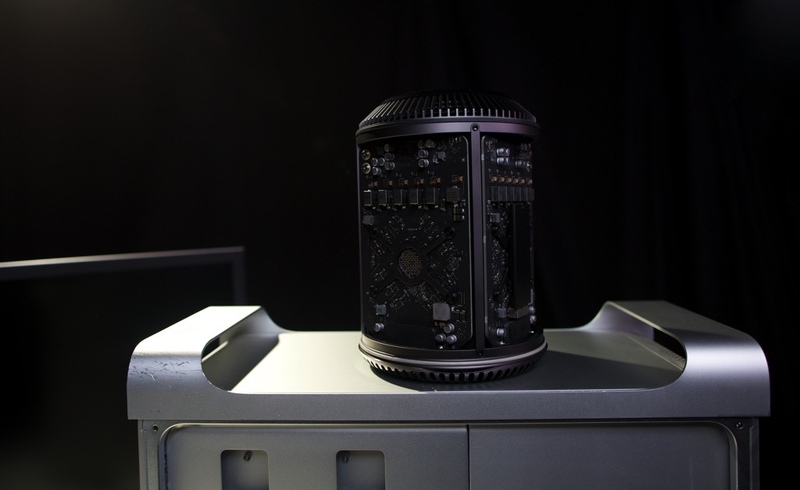 Shane Cole, AppleInsider — Without considering shipping costs, assembly time, or additional complications that may arise from cooling the machine, it would cost just over $14,300 to replicate Apple’s new Mac Pro spec-for-spec. For that substantial premium, we lose several of the Mac Pro’s tentpole features — notably Thunderbolt connectivity — and increase the computer’s size by nearly 300 percent. We would also forfeit the significant intangible addition of Apple’s AppleCare warranty service. 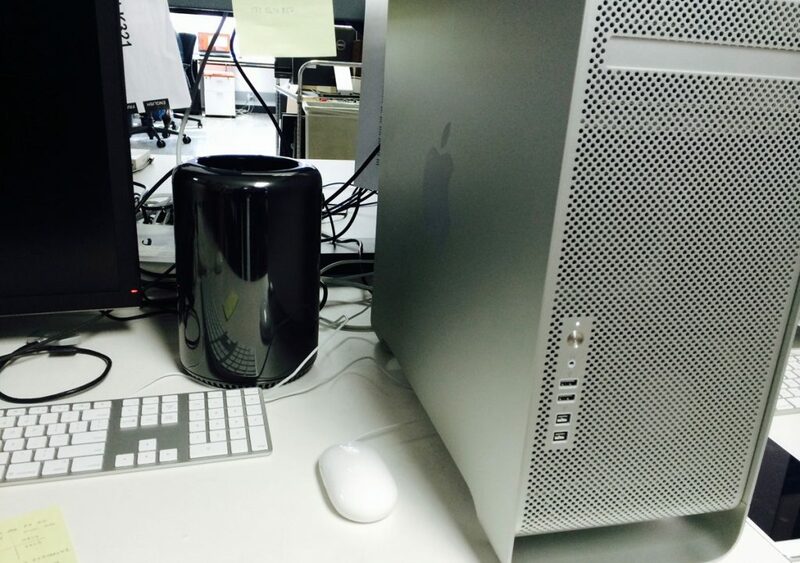 All in all, it appears that the new Mac Pro’s startling sticker price belies the exceptional value underneath. Molly Wood, The New York Times — The Mac Pro is extremely, ridiculously fast and powerful. The specifications are nearly mythical. … The Pro took just over an hour to convert 32 gigabytes of high-definition video into another video format — a job that took over three hours on my quad-core Mac Mini. And although the task noticeably heated up the Mac Pro, its fan stayed quiet, and it didn’t seem perturbed. It’s clearly capable of much more than a mere multimedia professional can throw at it. Brian Westover, PCMag.com: — The Mac Pro isn’t quite perfect. It’s expensive, even given the usual premium for Apple products, and the one-year warranty and 90-day tech support is short and lackluster. Whether or not the lack of internal expansion is a detriment is yet to be seen, but at the very least it’s a drastic change, that will force many professionals to change how they approach their work. At the very least, it’s safe to say that the Apple Mac Pro (2013) offers some of the most exciting updates to desktop design we’ve seen, and backs it up with powerful professional-grade performance. The Apple Mac Pro (2013) is our new Editors’ Choice for single-processor workstations, and one of the best high-end desktops we’ve seen in years. Stephen Fung, FutureLooks — But credit where credit is due. Apple has done a great job with this machine. And if your needs are specialized enough that the combinations of hardware provided by Apple fit, and you’re already using OS X, then it’s hard to say no to what they are offering. It is a very compelling offer for professionals using Macs who do require the precision and power of full blown workstation components. Dana Wollman, Engadget: — It’s hard to say if the Mac Pro is pricey, per se, given that there’s nothing else quite like it. There are plenty of Windows-based workstations, certainly, but none are quite this small or quite this portable (many aren’t quite this quiet, either). And if you’re a creative professional already hooked into Mac-only apps like Final Cut Pro, this is really your only choice: The new Mac Pro is a serious improvement over the old model in every way, and is likely worth the upgrade. So, while $2,999 (let alone $10,000) is indeed a big investment, it’s well worth it for people who live and die by their workstation, and for whom (rendering) time is money. Yes, there are certainly valid quibbles, but the 2013 Mac Pro’s cost isn’t isn’t among them when you consider how sublimely well-suited to the tasks it’s designed to performed. As shown abundantly shown by AppleInsider and FutureLooks, the 2013 Mac Pro is a superb value when compared to similarly configured Windows PCs even before one considers the time, effort and pure frustration required to build such a beast.